As we get farther into the autumn period, the weather gets a little cooler. It’s generally not bitterly cold this time of year, and in fact the weather can be beautiful. That’s what makes fishing such a good thing this time of year. However, there are some days when it does get pretty chilly, and eventually it’s going to get cold. That doesn’t mean we need to stop fishing: In fact we should keep fishing. The fish bite really good on some bodies of water in the cold weather, and a true trophy is a good possibility when the weather is cold. If we want to take advantage of this opportunity, we just need to adjust our fishing habits a little bit. Here are some ideas for more productive and pleasant fishing from now until ice-up. First of all, in the fall, it usually isn’t necessary to be on the water at sun-up. You can wait awhile and let the day warm up a bit. The best bite is usually later in the day, maybe from mid-morning to mid-afternoon. There can also be a good bite on some lakes after the sun has gone down, but that time of day is usually warmer than early morning. You can fish during the warmest part of the day and still have very good action. 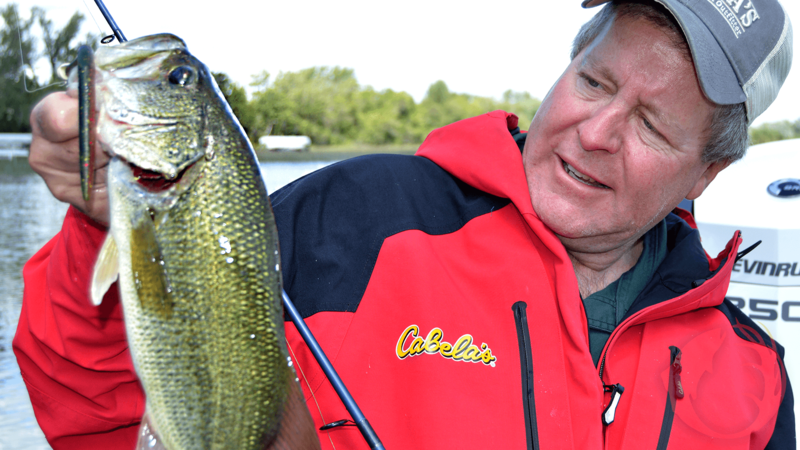 If you’re fishing for deep fish, say walleyes or crappies or smallmouth bass, do lots of sonar work. Let your depth-finder tell you if you should fish a spot. If it reveals baitfish or larger fish, give the area a try. If nothing shows up on the sonar, keep moving until something does. This works best in deep water because the cone angle of the transducer covers a larger area in deep water, which increases the odds of showing if fish are present. Once you find fish in deep water, give them plenty of opportunities to show you what they want. If you want walleyes, day in and day out, it’s really hard to beat a Fire-Ball jig tipped with a larger than ordinary redtail chub. Start with a four incher. If they like that, go bigger. If nothing happens, find a different group of fish. The fish in this school aren’t ready to eat, but they will at some time during the day. Check back with them later. Employ the same tactics for smallmouth bass and crappies, just use smaller baits for the crappies. To really enjoy your day on the water, you must dress appropriately. You’ve gotta’ dress for the weather. Dress in layers. Good underwear(not cotton) next to your skin, then a hooded sweatshirt, then a vest, then Cabela’s GuideWear. The GuideWear is great stuff. It breaks the wind and any moisture there might be, and it’s warm. If it gets too warm, take the outerwear off layer by layer. Once you get to a comfortable layer, you’re set. When the day starts to get chilly again, start adding the layers back on. The layering system is easy, comfortable, and effective. Try it! Cold weather or slow fishing is no excuse to not go fishing in the fall. The only reason you might rather not go fishing in the fall other than family commitments is that your favorite football team is playing, and that’s why we’ve got radios. If you just can’t miss the game, turn on the radio, listen to the game, and catch some fish. For some folks, that’s about the best fall day possible. Photo: Everything likes to get caught in the fall. Largemouth bass like this one can be especially aggressive.